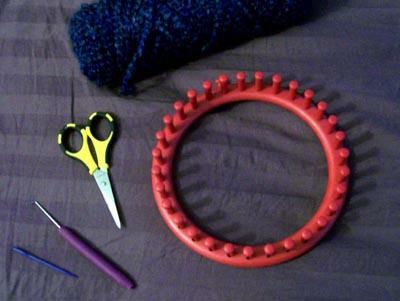 Learn to knit with the Knifty Knitter. Knitting has enjoyed a surge in popularity over the last few years as young women and men take up the craft that was once thought of as a hobby for grandmothers. All those new knitters know that knitting is a wonderful craft that allows you to make all sorts of useful and beautiful things with a couple of needles and some yarn. It's also a great way to occupy your hands while gossiping with friends, watching a movie or doing almost anything else. Knitting is thought to have originated in Persia, the Middle East or North Africa. Knitted socks have been found in Egyptian tombs dating from between the 3rd and 6th centuries. This makes sense because socks and leg coverings were among the first and most popular knitted items. This craft was usually practiced by the woman of the house to make socks, other clothing and blankets for the household, at least until the invention of the first knitting machine in the 1590s. After that time, knitting guilds were established to create knitted items to be sold, and men took over knitting outside of the home. Women still knitted for the household, however. In the 19th century, knitting machines were electrified and the advent of circular knitting machines made it easier to knit sweaters, hats and hosiery en masse. Knitting for others has always been popular, but during World War II the craft reached new heights. It was featured on the cover of Life magazine in November 1941, just weeks before America entered the war with the bombing of Pearl Harbor. Americans worried about their boys getting cold on the battlefields of Europe, so drives known as "Knitting for Victory" popped up across the country as women knitted sweaters, socks and mufflers for the men. Before America's entry into the war, knitters sent care packages to besieged Londoners and other European groups. The Red Cross directed most of the organized programs in America during the war, and even conducted workshops on carding and spinning since mass-produced wool was in very short supply. Red Cross knitters also made cotton bandages in stretchy garter stitches that were sterilized and sent overseas. Today, knitting is one of the more popular handcrafts, passed from person to person. And, these modern knitters are connected down through the generations to the first knitters thousands of years ago.